Can a Small Business Use Trade Shows to Find Suppliers? As a small business owner or small business supply chain professional, you probably have your stable of tried-and-true suppliers. And you may have been relying on these suppliers since the beginning of time. But now — for any of the reasons we’ll discuss below — it might be time to find new suppliers. Trade shows used to be the one reliable way to visit a bunch of suppliers in a single location. But in the Age of the Internet, are trade shows still relevant? Are trade show still the best way for small businesses to find new suppliers? The advantage that trade shows used to have over all other sourcing methods is that trade shows were able to put a lot of suppliers in a single location. But guess what modern sourcing tool also puts a lot of suppliers in a single location? That single sourcing location with a lot of suppliers in it can either be a convention center or your computer screen. That’s right, you can book a plane ticket and hotel room for some far-off trade show or you can do a Google search. You get an opportunity to meet your suppliers face to face. There’s nothing like looking a potential supplier in the eye and shaking their hand. This gives you a chance to put a face to a name and have a meandering conversation that could lead to pertinent questions you hadn’t thought of before. Suppliers also tend to bring samples to trade shows, so you can see, touch and feel what your product might look like. There used to be one way to see what your suppliers’ production facilities looked like — and that was to visit your supplier’s production facilities. Photos might be enough to pique the interest of a supply chain professional, but not enough to make an educated sourcing decision. Suppliers then added video and virtual tours to their websites. Now, a supply chain professional can tour a supplier’s production facility, confirm a supplier’s ISO certification and meet that supplier’s management team without leaving his or her desk. The number of supplier websites available to view is practically infinite. The number of suppliers you can visit at a trade show is limited to the number of suppliers who signed up to exhibit and paid for a booth. If you’re a small business supply chain professional, it may not be economically feasible to visit all of the potential suppliers out in the world. Supplier websites are a great way to cull the herd and to identify which suppliers’ booths you want to visit at an upcoming trade show. eSourcing events or reverse auctions are great tools for those companies who have the resources (i.e. money) to invest in the right software. If your small business doesn’t have Ariba or a similar platform, eSourcing events are not a viable sourcing tool. With eSourcing events, you can post your product need, specifications, annual volumes, and other requirements online — and suppliers will find you and submit quotes. But without the right platform, these types of tools are not a reasonable sourcing alternative for small business supply chain professionals. You’re better off going to a trade show and meeting new suppliers who you can reach out to with a quote or proposal request. There is no better way to understand a potential supplier’s capabilities than for a supply chain professional to walk that potential supplier’s production floor. The limitation here is cost and time. Even if a small business supply chain professional’s travel budget allowed for him or her to visit two dozen different potential suppliers, who has an extra couple of months set aside to make those visits? 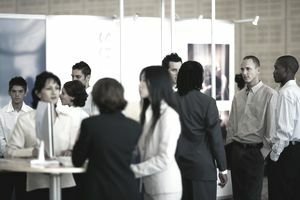 Trade shows allow supply chain professionals (even small business supply chain professionals) the opportunity to visit two dozen suppliers in two days. And while trade show face-to-face meetings aren't as valuable as on-site visits, supply chain professionals can use the trade show face-to-face meetings to figure out which suppliers they do want to visit. Trade shows are typically in convention centers that could house several football games and a municipal airport at the same time. Supply chain professionals typically wander the convention center aisles, working to avoid eye contact with the exhibitors in their booths. At the same time, the exhibitors in their booths are desperately trying to get someone to talk to them. Free pens? Check. Those little mints with the red swirls? Check. A cosplay Spiderman? Probably not, but why not? Anything to draw foot traffic. The most efficient way for a supply chain professional to approach a day or two (but no more than two, or your brain will explode) is to do his or her homework ahead of time. If you're that supply chain professional, research the trade show directory and identify the suppliers you want to visit. The directory will have a high-level description of each supplier, including the supplier's capabilities and production facility location. Choose the suppliers you want to meet before you arrive at the trade show. Then use the directory and the exhibit map to plan your day(s). As mentioned, these convention centers are typically monstrous. Plot which suppliers you want to visit on the floor map. You don't want to waste your time bouncing from one side of the convention center to the next. Also, trade shows are a great way to meet with your existing suppliers. You might have several incumbent suppliers all under the same roof, so take advantage of this time to meet with them. You'll also get your incumbents' attention when they see you're at a trade show meeting new suppliers. This could be a good chance to talk about any issues you have with your incumbents. Finally, leave a couple hours for wandering. Schedule in time for you to peruse the floor and look for unexpected innovations or technologies that you might not have considered before arriving at the trade show. But be sure to schedule this time, otherwise, you could spend two days wandering. Trade shows are still a valuable way to research suppliers — but with the amount of information available today on the Internet, trade shows should complement your sourcing activity. Why Are You Looking for New Suppliers? The first three bullet points above mean that you’re having problems with incumbent suppliers that are severe enough to send you looking for new suppliers. How do you know if you the supplier problems are that severe? Are those supplier problems causing you to miss deliveries to your customers? Or are they driving costs so high that they are impacting either your profitability or even your company’s viability? Then those problems are severe enough to cause you to look for new suppliers. If you're looking for new innovation or new products, trade shows are a good way to see what's available. But be sure to schedule in the time to wander the trade show floor, otherwise, you could spend all your time wandering and not accomplishing the other important tasks you came to the trade show to accomplish.